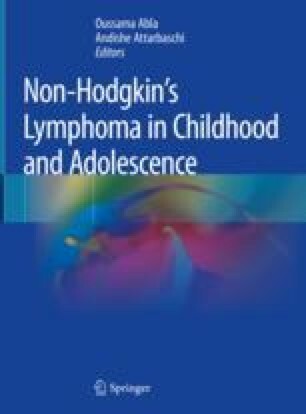 Non-Hodgkin’s lymphomas (NHL) of children and young adults differ considerably in biology, incidence, treatment, and outcome compared to lymphomas occurring in adults. They constitute a diverse spectrum of usually highly aggressive tumors derived from both mature and immature lymphoid cells. The diagnosis is accomplished by combining histomorphologic, immunophenotypic, and genetic features into specific lymphoma subtypes. Besides the classical high-grade lymphomas arising preferentially in the pediatric population, such as Burkitt lymphoma, lymphoblastic lymphoma, and anaplastic large cell lymphoma (ALCL), reports of several unique clinicopathologic lymphomatous conditions with a rather benign clinical course have occurred in increasing numbers, which have eventually led to the acknowledgment as separate entities in the updated WHO 2016 classification of tumors of the hematopoietic and lymphoid tissues. Among T-cell lymphomas, more precisely characterized genetic and phenotypic peculiarities of ALCL and peripheral T-cell lymphoma (PTCL) have led to distinct subcategorization with evidence of clinical importance. Exact pathologic diagnosis provides the basis for therapeutic management and risk stratification. Here, we describe characteristic pathologic features of lymphomas arising in the pediatric age group, with on one hand emphasis on the most common subtypes, on the other hand with description of the most important diagnostic features and the differential diagnosis of the newly recognized entities, such as pediatric-type follicular- and marginal-zone lymphoma, as well as large B-cell lymphomas with IRF-4 rearrangements.